According to CNBC, more than half of Americans (57 percent) have less than $1,000 in their savings accounts. One personal injury accident can do more than enough damage to wipe out those savings. That is why Certified Legal Funding provides plaintiffs with pre-settlement funding so that they can afford to pay their bills. 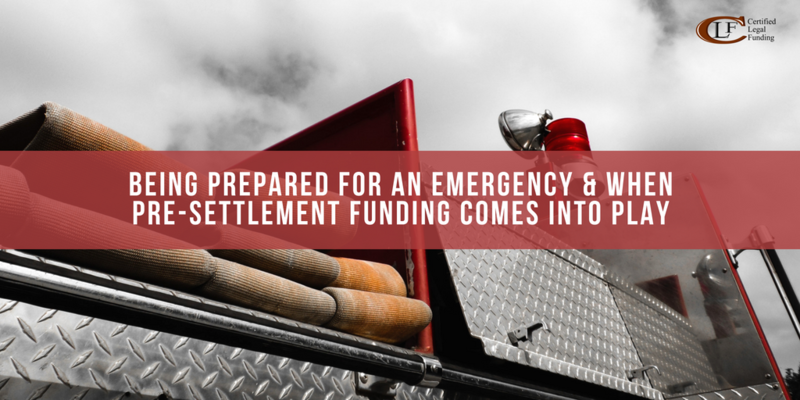 However, even with pre-settlement funding, it is still important to be prepared for an emergency. This is so that you can still survive without pre-settlement funding. Take a look at three important steps to take in order to be prepared for an emergency. Being prepared after the emergency doesn’t really help. It’s being prepared beforehand that helps. Most people start preparing for an emergency while they are currently in one. At that point it is already too late, but nonetheless now is the best time to start preparing for a future emergency. Granted, building up your cash reserve isn’t so easy. But, doing so will be quite beneficial down the road. A general rule of thumb is to have enough money to cover about six months’ worth of expenses. However, if that seems like a daunting number, try aiming for three. Make this emergency fund a monthly expense that cannot be touched and must have money going in. Having credit available when you are in a pinch could be extremely valuable. But, only fall back to credit as a last resort. It’s great to have as a fallback, but only in cases where you absolutely need it. Invest by purchasing quality insurance. Choosing a cheaper insurance option means that when you are in an accident, you will have to cover more of the costs. Avoid that by instead choosing to find a more comprehensive insurance plan that has better coverage. Take a look at your budget and see what you can cut out. See what your options are when it comes to creditors. Also, discuss with them about repayment. Contact CLF to learn about how pre-settlement funding can help you get back on your feet.